Ferrara completes a home run during a softball game against Emery students. The day is bright. Emery six graders are trying to topple the six-grade staff at softball. It’s futile. Jennifer Ferrara swings, and the ball slices through centerfield. The 24-year teaching veteran stands at first base. The crowd cheers. She’s having fun. It’s expected. Ferrara counts expectation as a tool she uses for student success, and her intensity on the playing field is matched by her intensity in the classroom and her career. Raised by two teachers, expectation was built into her life 24/7. She’s not complaining. Her parents gave her a sense of self-discipline and work ethic. She likes who she is and expects the same of the world around her. Her global outlook on student life in the 21st Century isn’t as glowing. 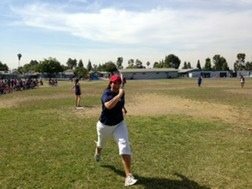 A changing game field has placed a generation of children behind the gaming console instead of behind a baseball bat or a soccer ball, she says as she cheers a hit by a staff member. The students fumble the ball. She laughs. Growing up in La Mirada, Ferrara knew to be home when streetlights signaled nighttime. Her childhood was spent on family field trips to places like zoos and museums. Riding a bike meant living in a three-dimensional world with real life experiences not found on a computer screen. In other words, no game chip substitutes for the passion and experience of real life, especially when you live in an Italian family where there is plenty of food and fun where it’s often loud, she will tell you. Plus, Ferrara finds academics are not all about academics. Student success is also fostered through social interaction and activities. Excellence is a shared experience, she says. Her advice? Students need to move around. Games and free time lead to the twin tools of competition and cooperation. Through these types of activities students become physically fit and they learn to work with each other. “And physically fit kids do better,” she says. Unfortunately, current educational trends aren’t meeting these student expectations for Ferrara, and she doesn’t worry about letting her opinion be known. She cites the elimination of junior high woodshop class as one disappointment. As a former kindergarten teacher, she believes a student’s first year should be based on developmental needs, the ability to socialize and work together. Reading should be taught when students are six and-seven years old, she says. “I think we’re rushing them,” she says. She also believes student expectation should be set individually, something current standards don’t address. A pair of pink high top sneakers makes this point. Located on a top shelf, six-graders take notice. “Every student should be treated differently,” she says. The shoes spell out the difference. Not everyone is suited for those shoes, she says. Everyone has different skills, as they have different shoes. Not every shoe fits every foot. If she receives a complaint about modifying another student’s work, she point to the shoe and says, “If the shoe fits.” Students get it. Some need less work; some need to be challenged. This is her credo. It works. While the pink sneakers make her point, colleagues agree she doesn’t exclude herself. She sets the right expectations for everyone, but the highest for herself. Asked to describe Ferrara in one work, Crawford said “insatiable.” Drawing from Ferrara’s childhood, she won't stop until the result is perfection. This can be a two-edged sword, Crawford says. Some will let her do the work. However, they know it will work out right. Her colleagues in the sixth grade agree Ferrara’s dedication to task gives her the edge to get things accomplished. She does it out a sense of passion, sixth-grade teacher Steve Little says. Another sixth-grade teacher says Ferrara also keeps it humble. Although they’ve worked for many years together, Jon Christensen said he was surprised to learn how many organizations and causes she belonged to. When Ferrara was chosen district teacher of the year, the list seemed endless, he said. The game ends, and Ferrara smiles. She’s batted a perfect game with one home run on this bright day that includes fun that’s sometimes loud but always expected.